Retrospection. Review and Remember Your Notes. 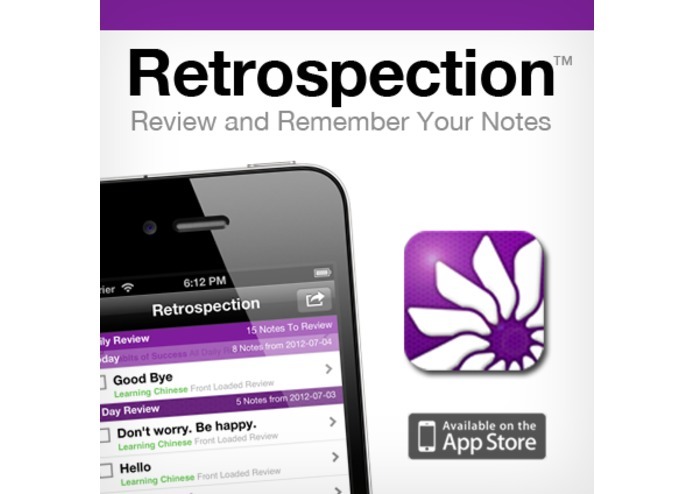 Retrospection is a note review iOS app to help you improve the way you review and remember your notes. It's a tool that automates the retrieval and review of the knowledge you've saved. 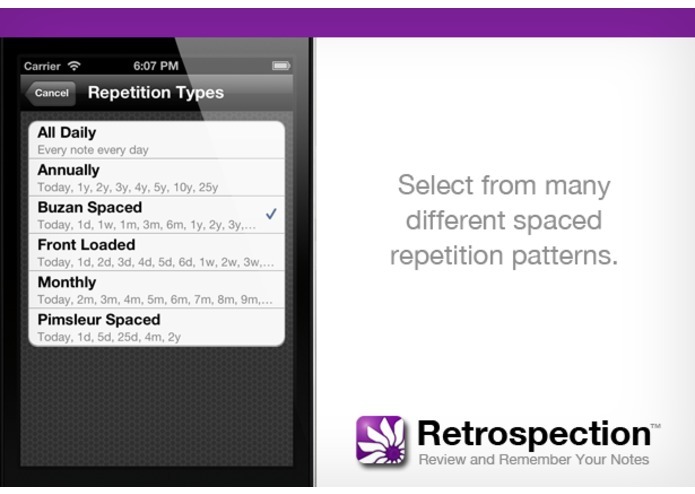 You create collections of notes you want to review and it generates a intelligent schedule of reviews using spaced repetition. Then, every day, Retrospection presents you with an updated list to review and check off based on the specific interval you selected. It's long been known that the best way to remember knowledge is to repeatedly review it. So if the knowledge you've saved in your notes is important to you, then Retrospection is for you. Every day is fresh start. No falling behind. Cheaper than a marker pen and a couple packs of index cards! I create and keep a lot of notes digitally using Evernote and I’ve found it to be a powerful and useful tool for storing and retrieving my notes. But I was frustrated by not having a systematic and automatic way to retrieve and review the different types of information I’ve saved. I wanted to be able to pull out my iPhone when I had a few moments and work my way through a brief review session. I also wanted to be able to keep track of my review progress (e.g. check off items) but couldn’t find anything that did what I wanted. So I designed and built Retrospection. With Retrospection I can pull out my iPhone whenever I have a few moments of ‘waiting’ time and quickly review the things I want to memorize, goals I’ve set, commitments I’ve made, etc. I can keep track of my review progress and build upon the power of my full note taking systems with a fast and customized reviewing experience on the go. 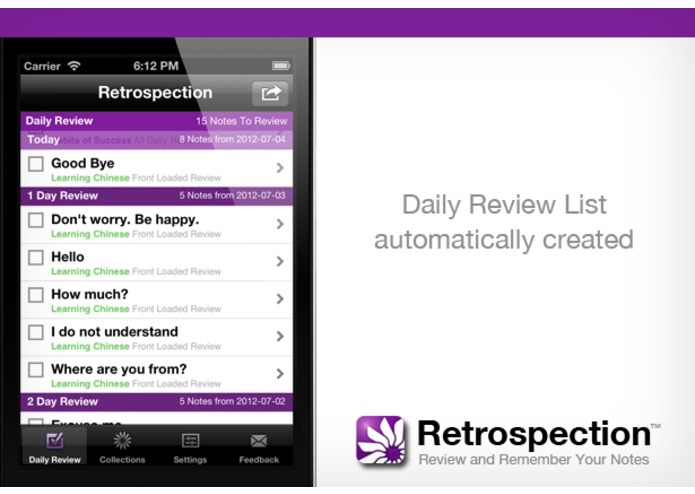 That’s why I created Retrospection, and that’s why I think you’ll find it a highly valued addition to your app arsenal. —Robert Pierce, Van Wrinkle, Inc. 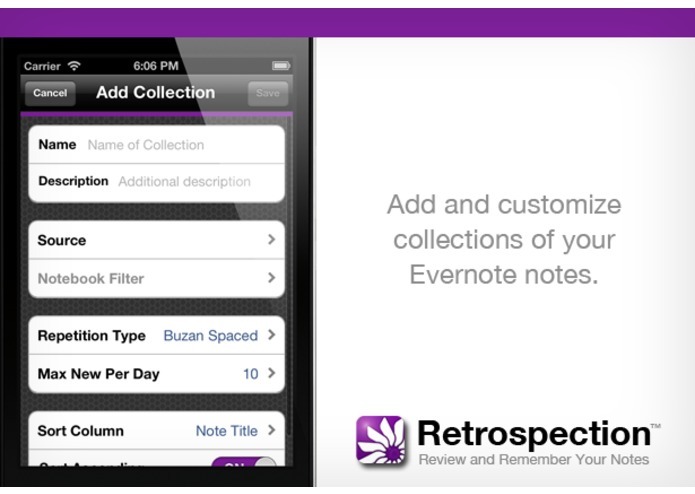 Thank you Evernote Team for creating this DevCup opportunity! Note: I am submitting v1.3.0b of Retrospection via Test Flight for DevCup consideration since it utilizes the new sdk and OAuth authentication. The previous version, v1.2.1, is live on the App Store (), but uses the old style username/password authentication. 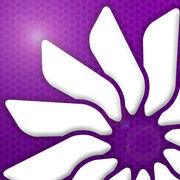 The TestFlight submitted version (v1.3.0) has been submitted to the App Store for approval and I expect it to be for sale after July 10.